I was totally inspired by my last trip to a local thrift shop. There was a collection of abandoned lamp shade frames that had seen better days but were structurally perfect. Talk about a bargain! There was a 50% off sale day and each shade cost me $2.25! I immediately knew they would be the focal point of my upcoming party in a nutshell. 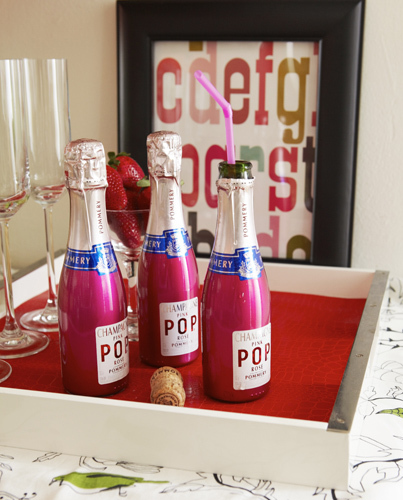 By hanging over the bar cart, they elegantly establish a bubbly champagne nook. Keep it budget friendly. 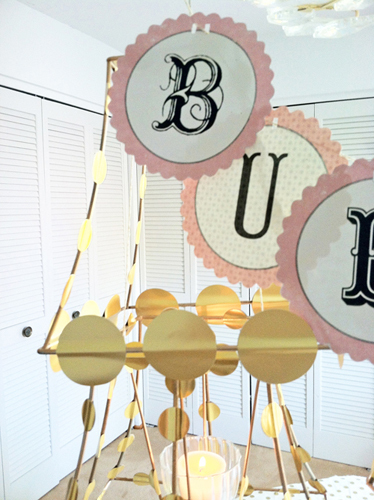 Use gold spray paint and gold sticker seals from the office supply store for extra shimmer. 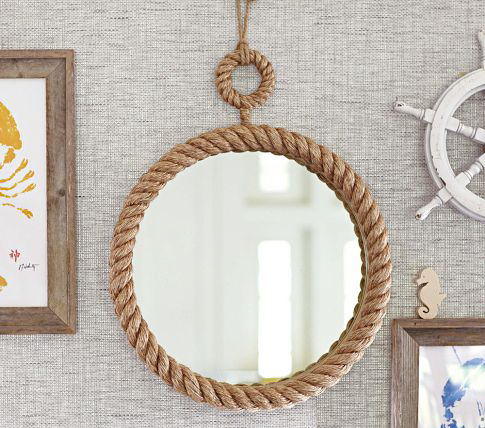 The gold stickers add instant drama to the frames without having to use pesky glue or tape. The look can also easily swapped out for the next party. 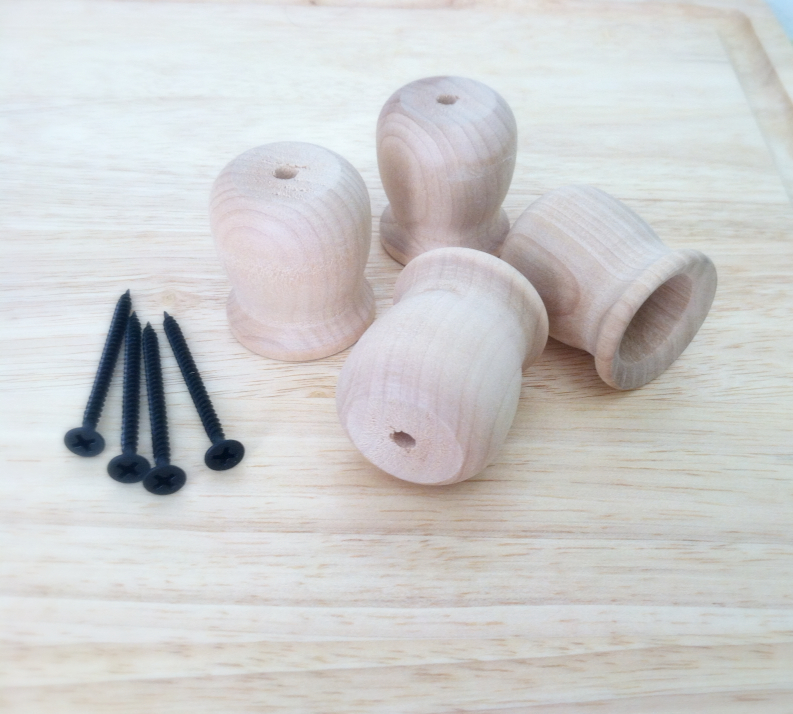 Two of the lamp shades came with what is called a “slip uno fitter,” the internal ring that sits underneath the bulb and holds the shade in place on the lamp. As it turns out the ring cradles a votive candleholder securely. Brilliant! My color scheme for the cocktail bash is pale pink and gold, and this paper banner has the perfect vintage pink hue and letter font I was searching for. I found it at a favorite spot, Paper Source. Because every storage inch counts, I made sure these three lamp shades stack compactly on top of each other before I brought them into my space. 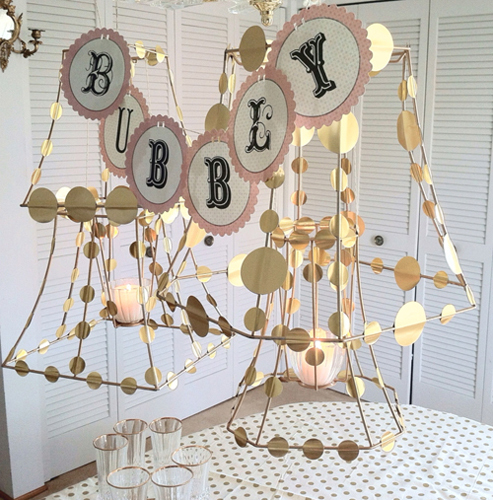 Have fun and give a lamp shade frame chandelier a whirl at your next fabulous fête!! 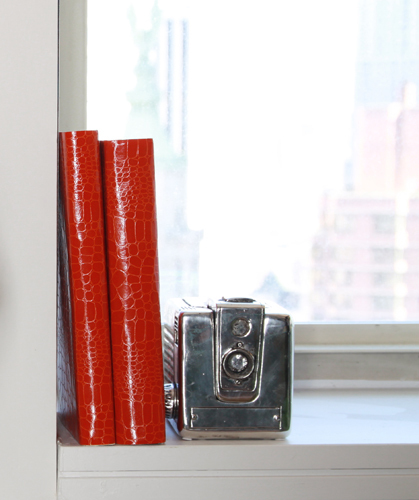 A little mock “croc” goes a long way to enhance your petite home décor, especially when it comes in the form of very affordable embossed paper. 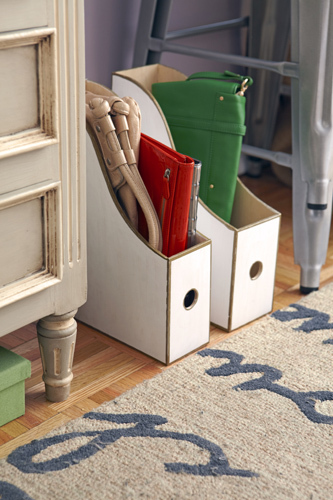 Layering in textures adds a sense of depth and interest to a plain, boxy space. Expect to spend about $4.00 for one 18×27” sheet that comes in a variety of colors. My favorites are the orange and glossy white. Find them at papermojo.com. 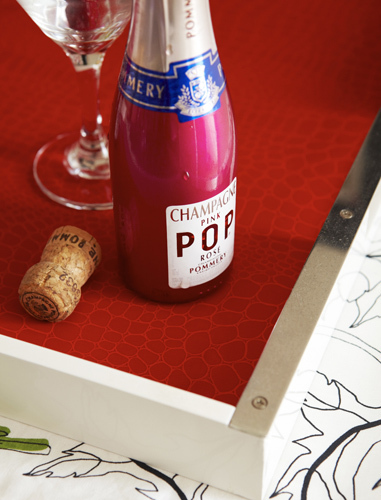 The embossed “croc” papers add a touch of glamour lining the tops of ho-hum trays and tabletops. A little double-sided tape under the paper will keep it from shifting and removable. The moc-croc paper also looks sleek as book covers for those resource books that have to be accessible and out on a desk. Old, tired lamp shades look fresh and modern wrapped in glossy white mock croc paper sheets. 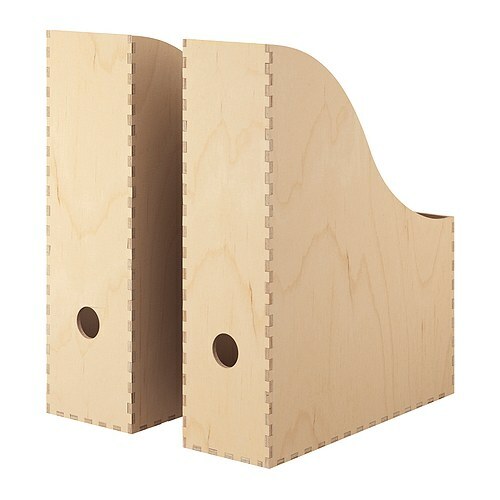 Plain Jane bookcases look designer with backs lined with white croc. And, dress up an ugly wastebasket in fabulous faux croc. No need to hide it under a desk. Enjoy! 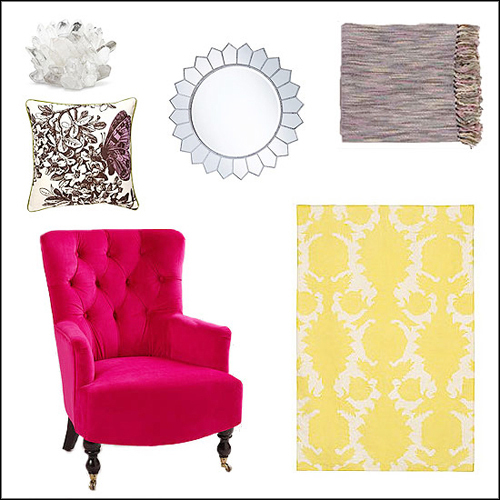 Most people ask me how to introduce color into their small space. When you live in a limited floorpan, the popular belief is that white is the most expansive color to use. I beg to differ. This formerly all-white, 400-square foot studio in NYC needed a foyer that commanded attention to prevent what I call shoebox syndrome. Character and depth trumps white and boxy any day of the week. 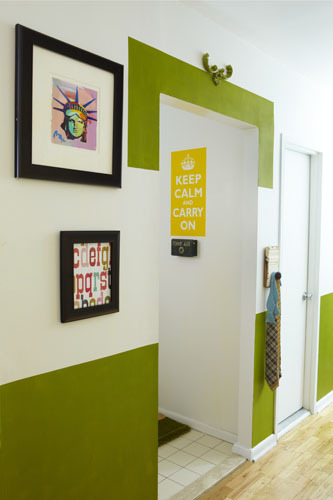 Add splashes of a bold color by painting only parts of the wall. 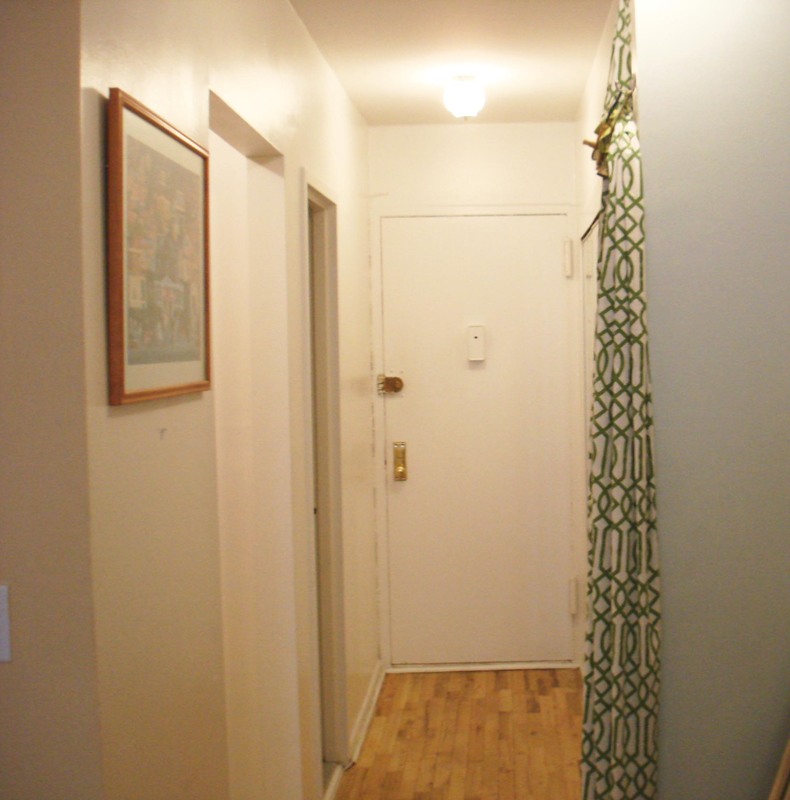 My design approach is to tape off and paint a 36-tall border, a little less than midpoint up the wall. 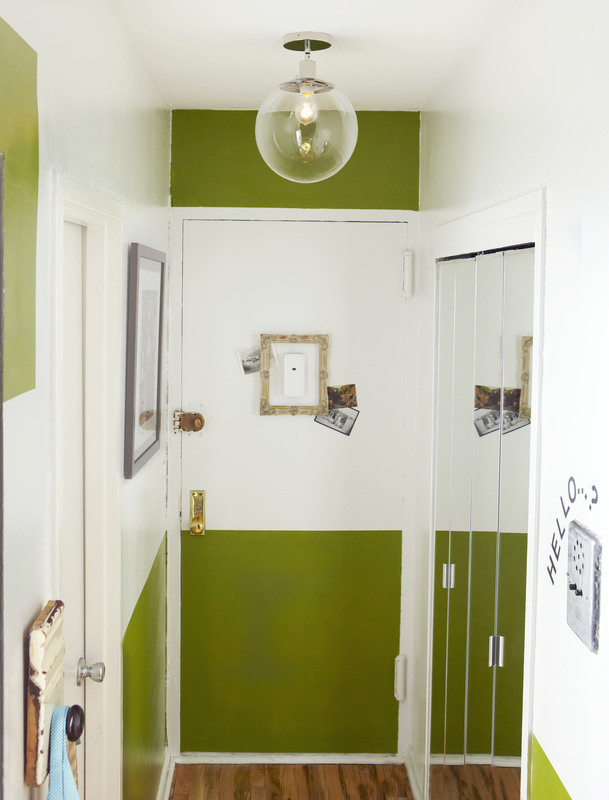 I think of it as my “faux” chair rail molding and in this tiny hallway, it provides just the right amount of verdant green without overpowering the tiny niche. Don’t forget doorways. I carried the painted border over the kitchen entryway and onto the top and bottom of the front door, giving the foyer a grander opening. 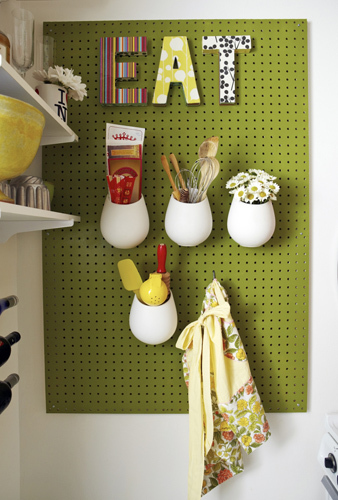 Sometimes the simplest solutions are the best, and tired-and-true pegboards really earn their keep in a cramped kitchen. 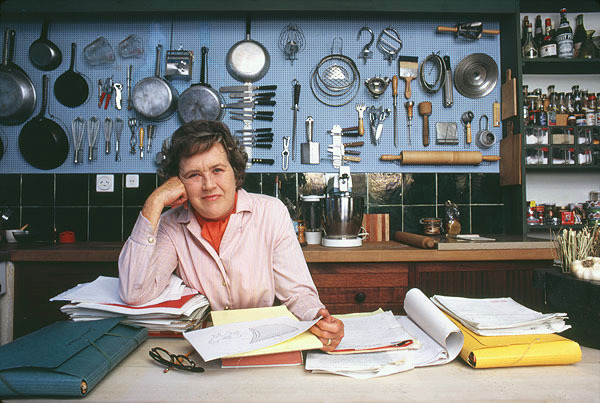 I now understand why Julia Child’s pots and pans pegboard is preserved at the Smithsonian. 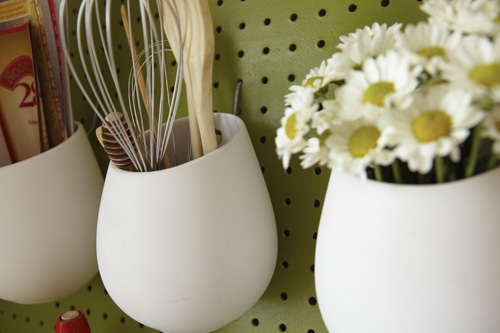 It’s a timeless storage solution that I have adopted in the kitchen and as a tool organizer in the guest-craft room. In my friend’s tiny NYC kitchen, there was an old, faded pegboard left behind by a previous tenant. It was so handy that I did’t want to throw it away. All it needed was a fresh coat of paint in a bold color. Sherwin Williams Verdant Green, left over from a previous project, gave the kitchen a modern retro feel I was going for. 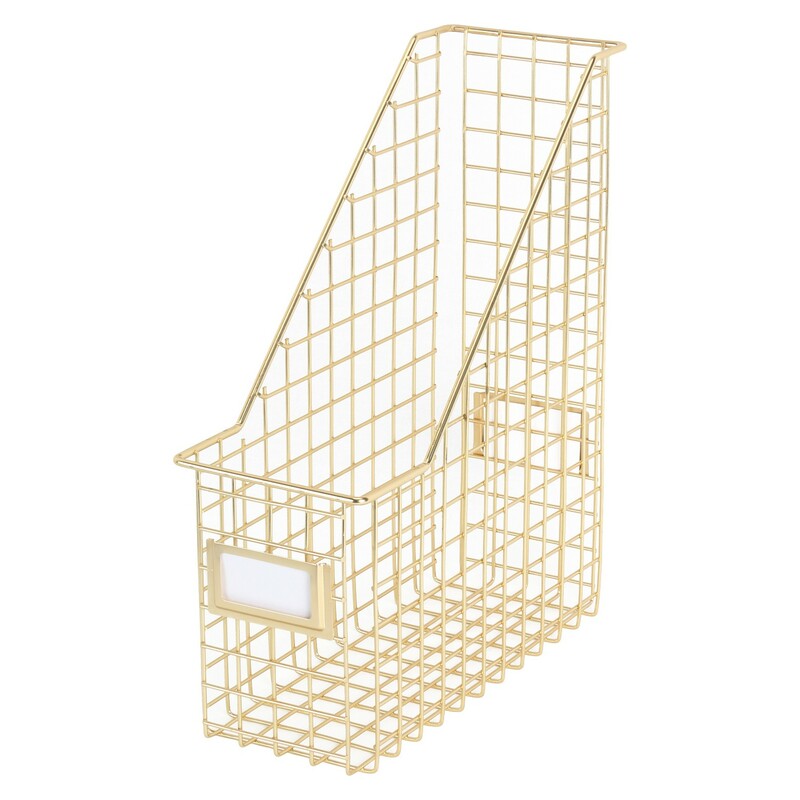 White Ikea Asker containers hang perfectly on the peg holes and they hold take-out menus, utensils and kitchen knick-knacks. For a personal touch, decoupage large cardboard letters a local craft store with decorative wrapping paper. 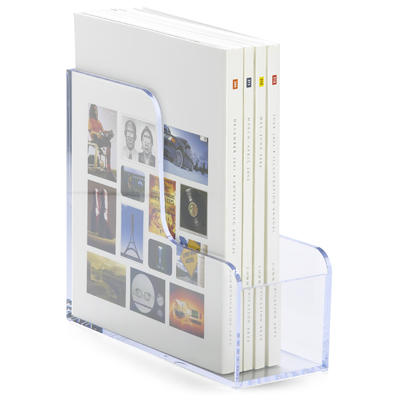 Make sure and protect your letters with acrylic sealant to keep them moisture proof. 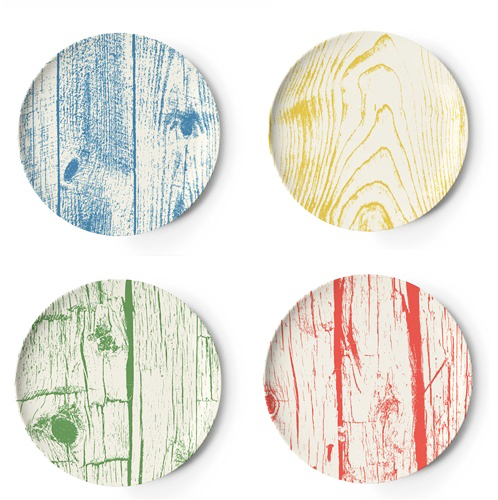 With a growing collection of affordable designer melamine plates on the market, it’s the perfect time to take full style advantage. They come in a variety of modern colors and patterns, and they are lightweight enough to safely attach to a wall with removable adhesive strips. 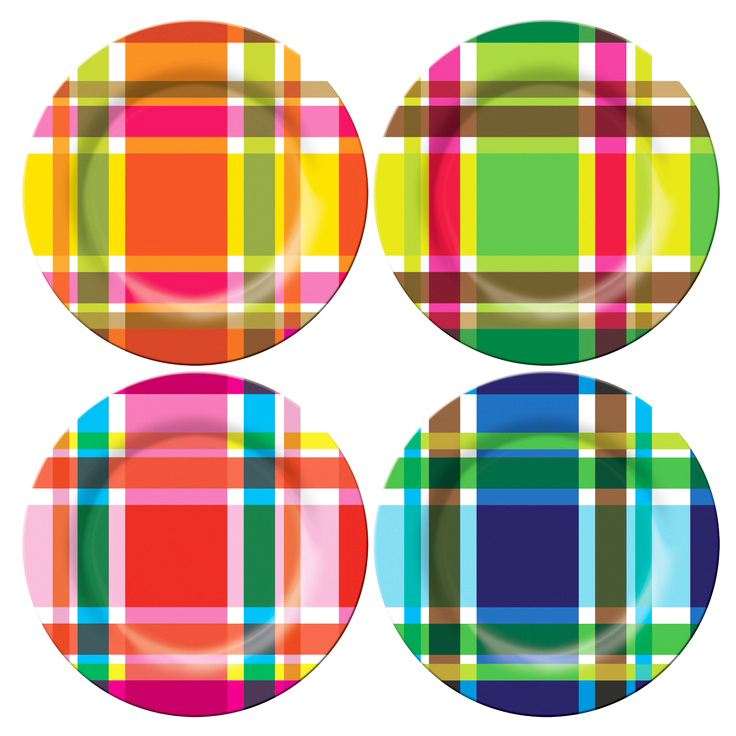 For this plate collage, I mixed and matched patterns like these plaid plates from French Bull with Thomas Paul’s faux bois coasters and dessert plates. 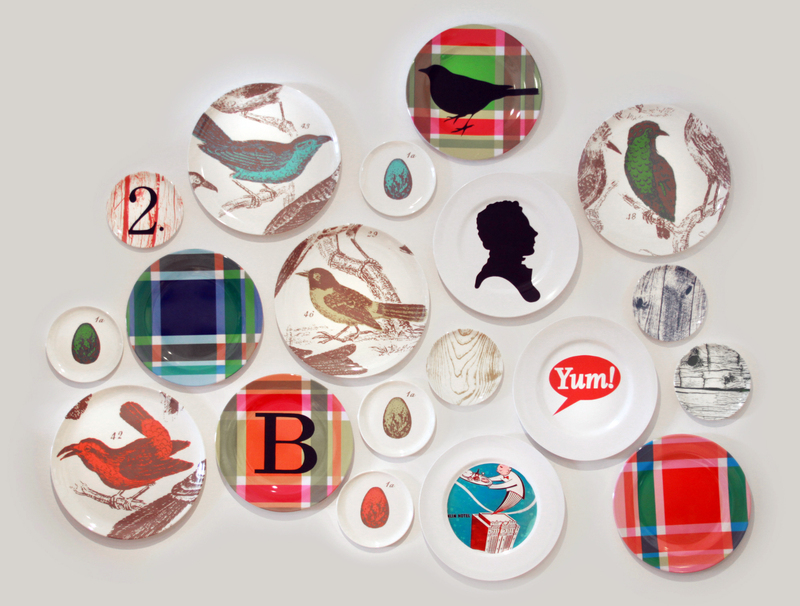 Play with a variety of plate sizes. 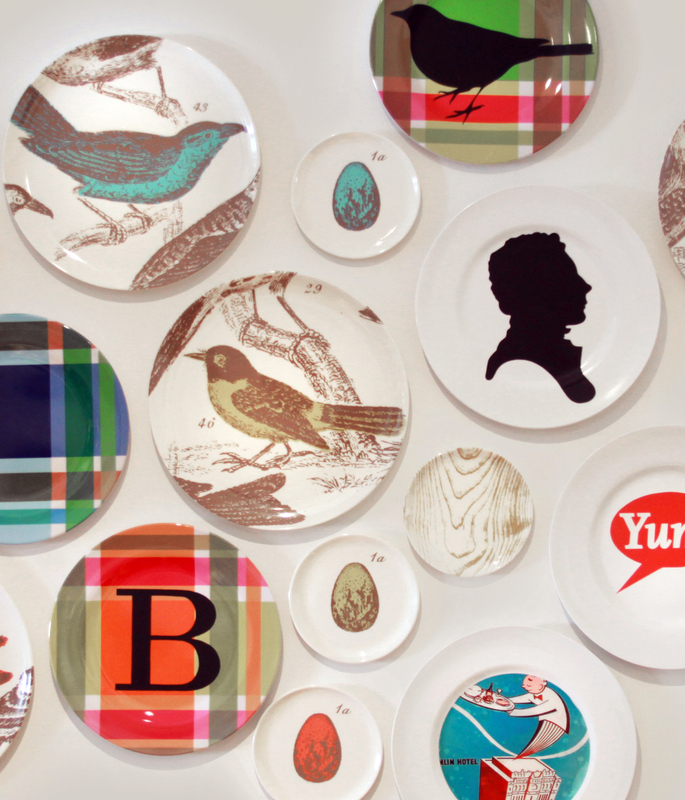 Round off the plate collage with black portrait silhouettes and monogram lettering printed onto Clear Avery adhesive sheets. Easy as 1-2-3. 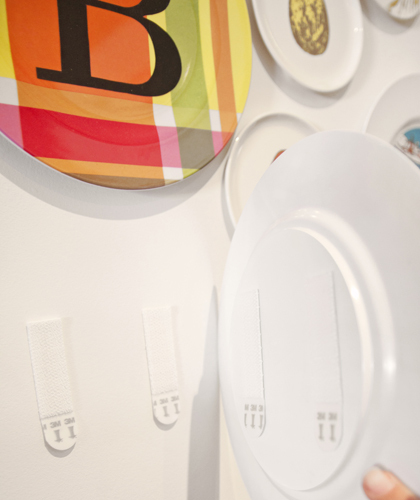 Command Brand picture-hanging strips keep plates secure and portable without any harm to the wall. I am always editing my design projects, and these strips keep the ideas fluid. Give it a whirl! 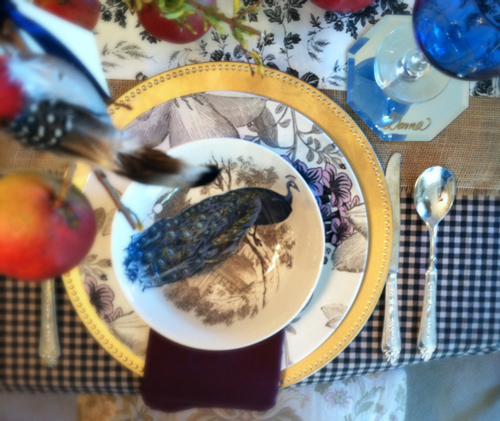 This year I am hosting Thanksgiving dinner at my home. I don’t know about you, but hands down this is my favorite holiday. Happily, my brother-in-law will be bringing the turkey, and I’ll be cooking up some of my favorite side dishes. I shopped my own house and am using my own dishes and stemware. I decided to repurpose a fitted sheet for the tablecloth. 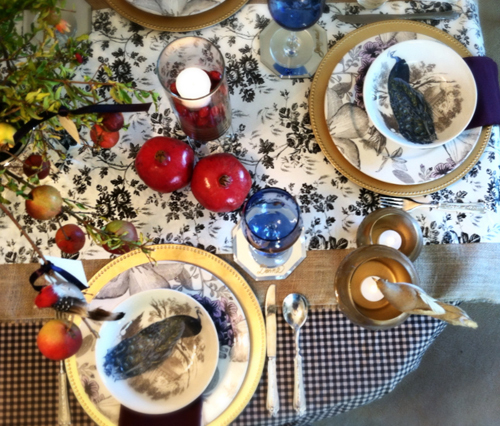 A queen sheet fits a 6-foot table perfectly—just cinch the sides with a safety pin to create a swag effect. • Mix high and low. Dollar Tree plastic charger plates in gold give my elegant dishware extra style points, and I can use them again for Christmas. Love these! 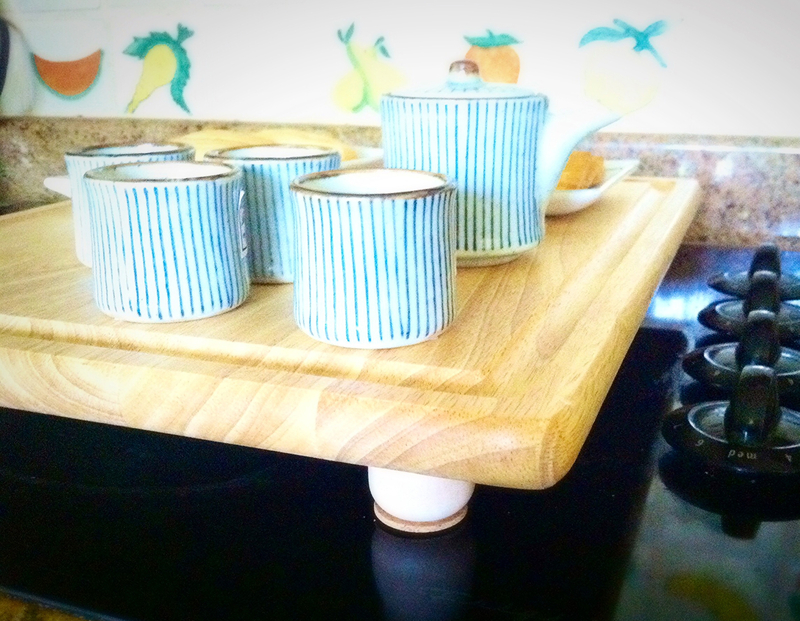 • Vary the heights of your table décor. Candlelight is your best friend at any party, and I like to create different levels of light and “glow.” Glue glass candlesticks to vases for dramatic candleholders in various sizes and shapes. 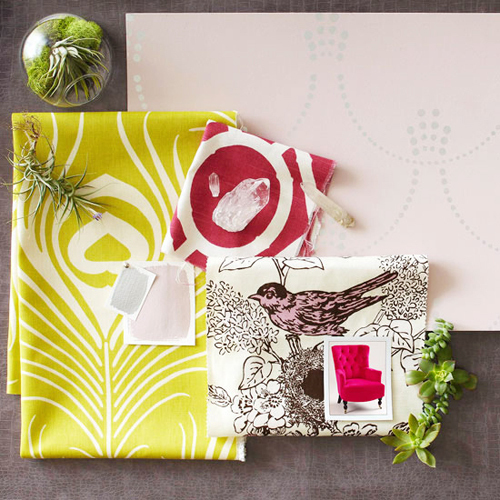 • Layer your table top with different textures and patterns. A scrap piece of burlap serves as my table runner base along with adhesive shelf paper in a gray floral pattern. The shelf paper is water-resistant, which makes spills easier to wipe up. • Add personal touches. Place cards welcome all of your guests to the table. I was thrilled to find these mini-beveled mirrors for $1 to use as my coaster/place cards. Use a gold Sharpie pen and write everyone’s name on the glass. Nail polish remover erases any mistakes and cleans them up after the party is over. These are definite keepers for the party prop closet. • Create a dramatic centerpiece. 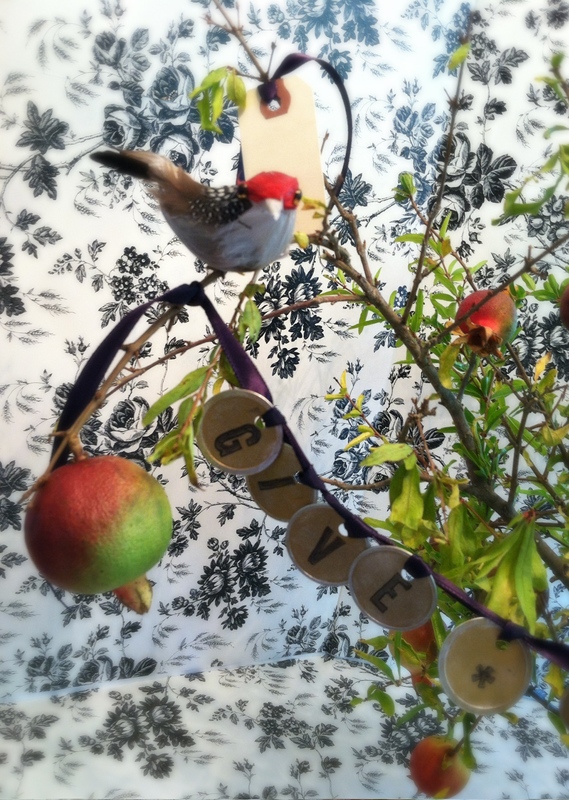 This year my parent’s mini-pomegranate tree was so bountiful I knew I would be using the branches for the centerpiece. I wanted to make a gratitude tree where guests would write what they are most thankful for on paper tags and tie them on the tree. The lovely birds were courtesy of the Dollar Tree. The gratitude tree will be a great conversation starter during dinner and will keep us focused on what the holiday is all about. Oh, the ubiquitous Mason jar, how I adore you. Scan Pinterest for mason jar projects, and you will be scrolling and pinning for hours. 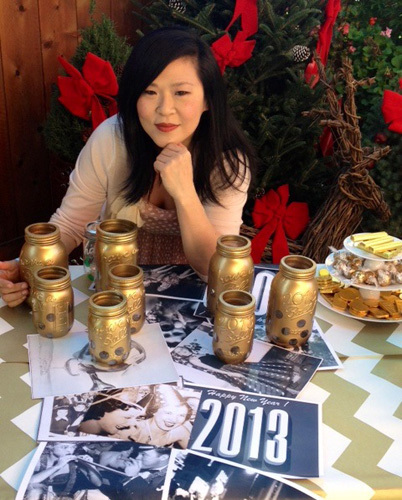 Recently, I was asked to appear on a local morning show in my hometown of San Diego, and I created these Mason jar lights for a New Year’s party segment. They would be perfect lighting up any special occasion. • Buy Mason Ball jars in the quart and pint sizes. Walmart has really good prices on the glass jars in boxes of six and twelve. 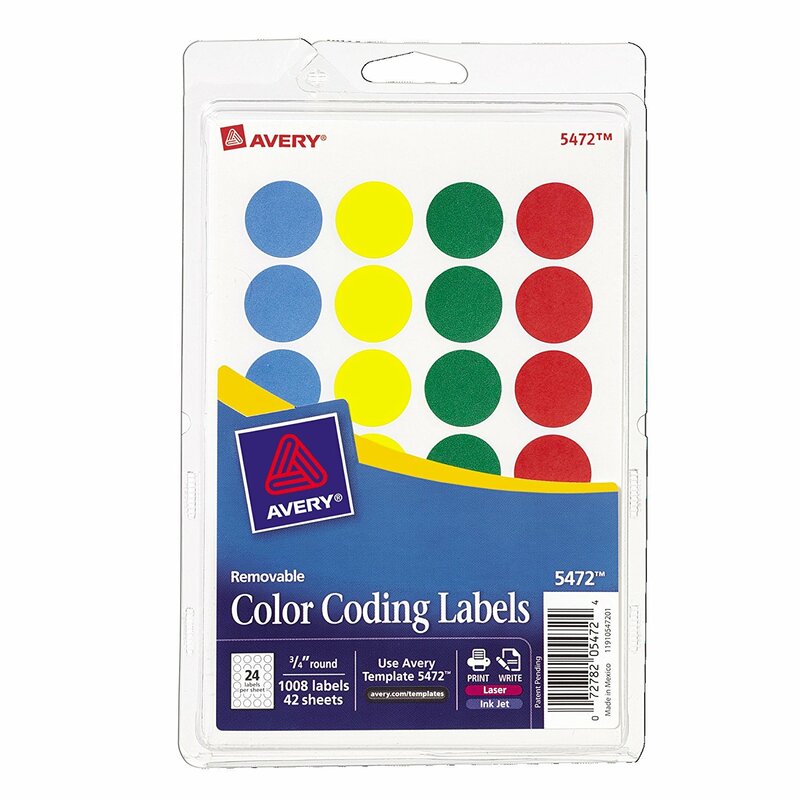 • Add round office file stickers in a random pattern along the bottom third of the jar. Once painted and peeled off, these round stickers will give the votive jars plenty of open “spots” for light reflection. • Screw the lids onto each jar. 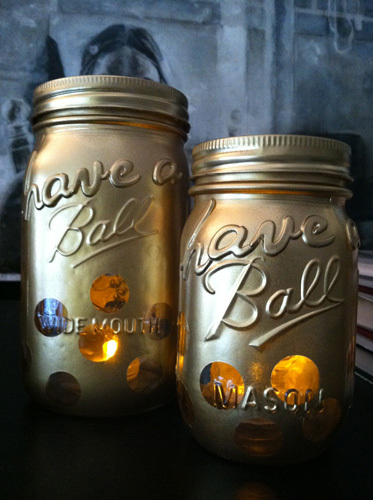 Spray the glass jars one layer of gold spray paint and let dry. 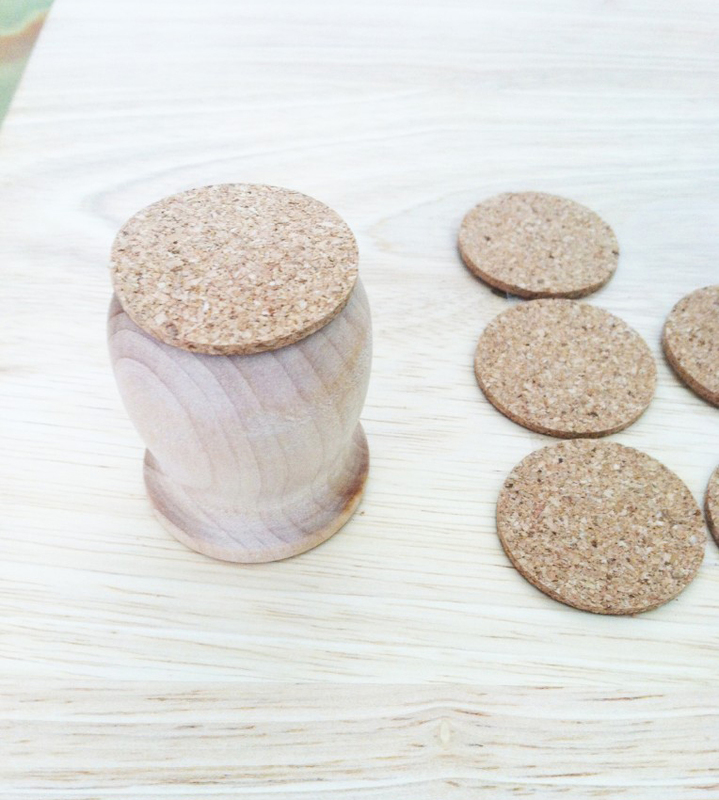 Unscrew the top and store away the removable round metal lid. 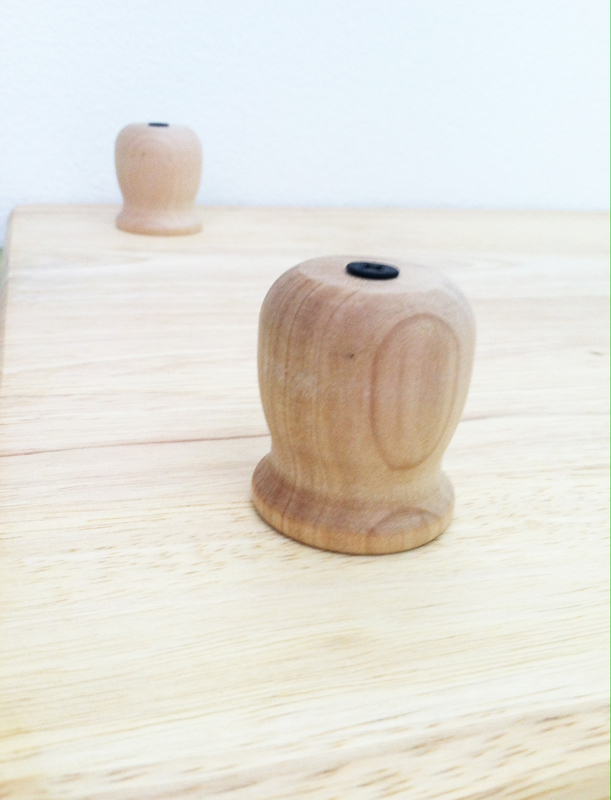 Re-attach the round band onto the jar. The open mouth will allow for more light to radiate. • Once dry, carefully peel off round office file stickers. 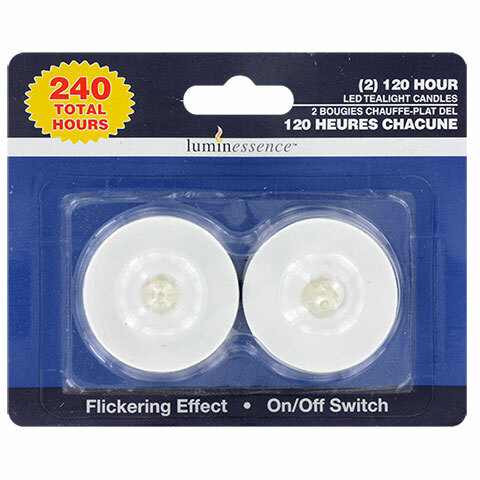 • For a candlelight glow that can last up to 48 hours, use inexpensive battery-operated LED tea lights from the Dollar Tree. Use two or more for extra glow in each jar. 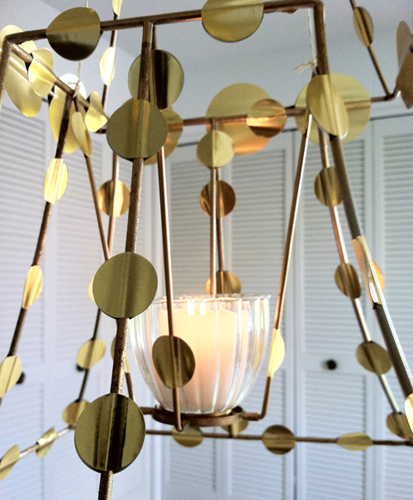 Check out more creative uses for battery-operated candles.